Norwegian Log will be helping a charity promote its vital health awareness work at RHS Hampton Court Palace Flower Show this summer. Landscape architect Emma Bannister is working with the charity National Association for Premenstrual Syndrome (NAPS) to build a show garden to raise awareness of the very common women’s health condition, Premenstrual Syndrome (PMS or PMT) - and Norwegian Log will be lending them one of its Contemporary garden buildings so they can engage with, and educate, show visitors about the condition. It is estimated as many as 30% of women can experience moderate to severe PMS, with 5-8% suffering severe symptoms (around 800,000 in the UK). Common symptoms include mood swings, depression, tiredness, fatigue or lethargy, anxiety, feeling out of control, irritability, aggression, anger, sleep disorder and food cravings. The condition can have a devastating impact on countless women and their families. The show garden, called ‘PMS: Outside Inside for NAPS’, has been designed cleverly to show the mood contrasts experienced by a PMS sufferer. At first view, visitors will see an area of hazel woodland. A closer look reveals the hidden center of the garden behind, and through, a curving willow screen. At the garden’s heart is a contorted hazel. The healthy, ‘normal’ and energetic feel of the outside of the garden contrasts sharply with the solitary, maniacal and distorted mood of the inside. To the side of the show garden will sit the Contemporary Building, built from solid log, where charity trustees and volunteers will be on hand to explain the impact of the condition on many women’s lives. They will be encouraging sufferers, their partners and families, to share and write down their personal stories. A special post box for these stories will be positioned next to the Contemporary building. The garden has been co-designed by Ben Donadel of EMJ Architects and is being supported by Holistic Insurance Services and Monro Consulting. Norwegian Log will also be exhibiting with another of its Contemporary garden buildings at the show, which runs from 5-10 July, on stand HC510, between the Festival of Roses and the Wildfowl and Wetland Trust show garden. 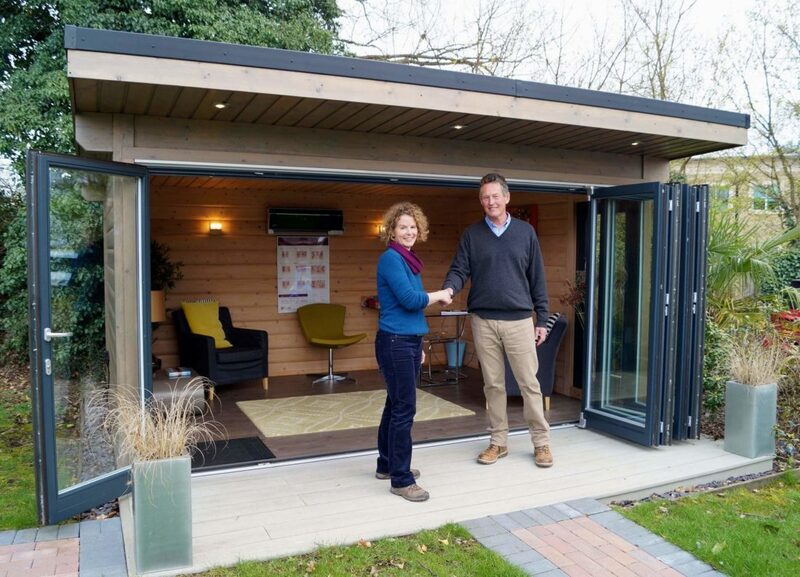 Picture caption: Garden designer Emma Bannister (left) with Nick Forrester of Norwegian Log (right).